We all hear a lot of different opinions on how and when to clean our BP firearms. I have always been of the opinion that sooner rather than later is the best policy and it really doesn't matter how, as long as the gun is clean and dry when finished. I don't believe that cleaning is as urgent as some guys profess but I have always cleaned my BP guns as soon as it is convenient. This past week I did a fair amount of shooting with several different long guns and revolvers. All were loaded with real BP (Goex 2F and 3F) and all loads had some lube involved in various amounts. Circumstances made cleaning guns a bit difficult on this trip so I left all the guns dirty until I returned home. 4 1/2 days. The fouling was still soft and clean up was as easy as if cleaning right after firing. The rest of the gun cleaned up just as well with no signs of rust or corrosion. I'm not advocating wait long periods before cleaning but this has convinced me that maybe I don't need to be in a big hurry to get things cleaned. I do live in a very dry climate and it may not be a good idea to wait 4 or 5 days to clean your guns if you live in an area where humidity is high. 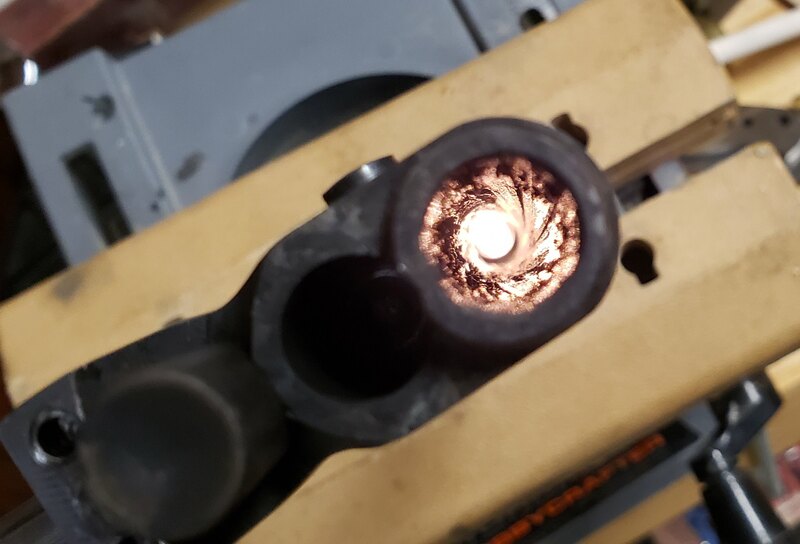 Barrel of 1860 Thuer conversion after brushing and swabbing with a bore mop. Cleaning as soon as possible is always best but I've been saying for years it wont hurt anything if it doesn't get done for a few days. It is very humid where I live and I have gone as long as nine days after shooting Pyrodex with no rust or corrosion. Whelp, I’m OCD about bores. I’ll clean those up before leaving for home. Those and chambers too (in a rudimentary way), pending later attention. A dirty gun nags at me and I’ve canceled appointments just to clean properly. Mike, you mentioned using a brush. Did you use a nylon or a bronze? I have nylon, bronze, and copper brushes. Most of the time I use the nylon brush. If it doesn't do the job with a few passes then I'll get out a bronze or copper one. I use lube in all my loads so fouling is usually pretty soft. All I use is bore mops. At first I cleaned them as soon as I was finished shooting. Then I found out I could get by for a day or two if I had to. No harm done to my gun because of it. I found a little while back if I would just run some water through my gun and dry and oil it I may get by as long as a week. Real black powder doesn't like water at all, and cleans up faster than any of the subs I've used. But I never played around with the idea till I ran into some of you guys. Those guns used during the war didn't have a lot of time to set around an clean their guns with much more than water and some kind of grease, and some of the samples we've all seen in pictures all look to be in pretty good shape. The finish my be a bit wore out but a lot of them are not all rusted out like you would think they'ed be. I retired ten years ago so I got the time in the world for cleaning my blued guns. I usually clean them soon as I get home but the OCD bit in me makes me a bit paranoid, ridiculous I know but at the range I spray them with a good dose of Ballistol into the bore and chambers and all over the outside. My Navy Yank snub still looks like brand new. Signor Uberti stainless Remington just goes in the dishwasher minus his grips and trigger guard. But even he gets a good dose of Ballistol at the firing point first before he goes home. Yep, I agree NE, clean them as soon you can but don't lose any sleep over it if you can't get it done immediately. I hose the bores and chambers with Ballistol before heading home. Then it may sometimes be a few days before cleaning them but I prefer to do it that night, or the next day. I say, if you need a brush to clean the bore you're not using enough lube in the loading. Caked-on fouling means that the last bullet you fired didn't swipe out the fouling from the previous. Instead, it burnished the fouling into the bore wall. "Soft" fouling is a relative term, and so the definition here is "soft enough that no brush is ever needed" which indicates, "soft enough that no fouling accumulation occurs". Ideally, a tight fitting jag and patch, or a mop, should be able to wipe the bore smooth with ease, even without the Ballistol. A part of this proper regimen is to blow down the bore and over the cylinder face and chambers after every cylinder full. That moisture plays a key role in keeping the fouling soft. This has all been document and archived some years ago. 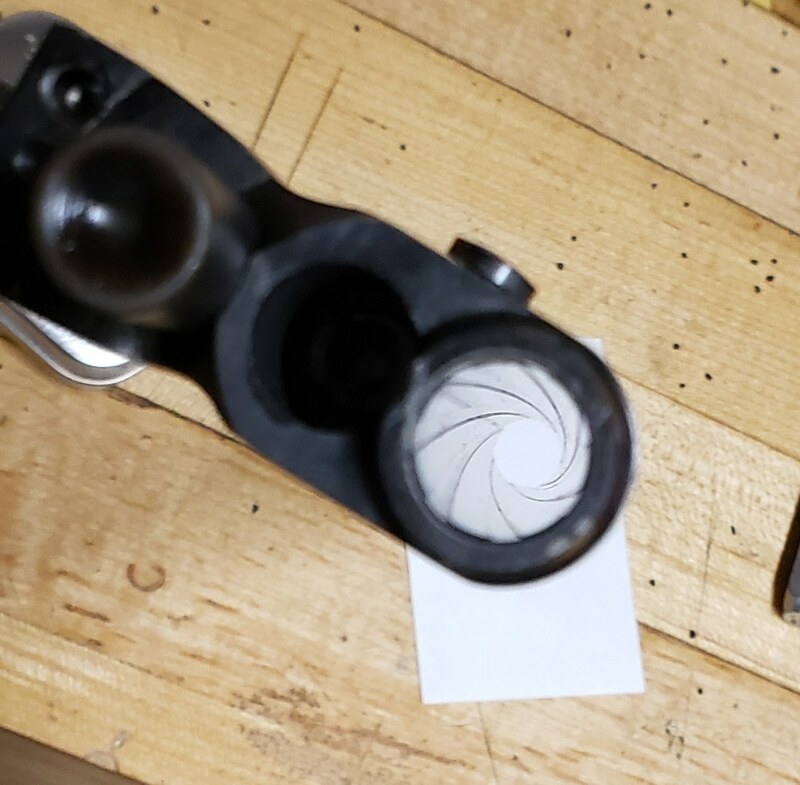 A sticky in the powder section on this forum demonstrates positively and conclusively that 100 or more shots can be fired in succession, and then a single, dry patch can swipe the bore smooth afterward, with a single pass (just like the last bullet did). Also; I've seen more rust from using boiling hot, soapy water than from leaving a gun several days without cleaning. Cutting all the grease and oil off of the steel is the worst thing you can do. Therefore I always use plain hot tap water. If I'm cleaning a pistol I do it directly under the faucet. Never does a soap or detergent come in contact with my guns intentionally. I hose the bores and chambers with Ballistol before heading home. I clean the same day that the gun is shot, usually that evening. I’m no fan of the cleaning process and would hire the job out if it were practical, which it isn‘t. Also, I can rationalize and procrastinate as well as anyone but when time is working against you (see the hydroscopic properties of BP fowling) one has to just nut-up and do it. Scheduling is useful and if there isn’t enough time to shoot and clean then I don’t shoot. Except when camping I’ve never gone over 24 hours between a shoot and a clean. I’d feel like a lazy slacker if I did. I remove and submerge the cylinder and cones with each cleaning but only get into the action parts about once every nine months or a year. Born 100 yrs. late ! i run several wd-40 patches over jags down the bores and in each chamber before leaving the range. Liberty is a well armed Lamb ! Hay Cross Plains Drifter, how long you been running WD40 down the bores and chambers like that? I've always thought that, and modern gun oils would cause black powder fouling to rust the insides of the bores and chambers. I never wanted to chance it. No it won't cause rust. If you used it for lube when firing it would make a mess that's harder to clean but it won't cause rust. Anything that keeps the fouling wet will keep rust away.